A few months ago, in an unannounced visit to a government community health centre in rural Tamil Nadu, I found four doctors, several nurses and technicians, and a functional pharmacy attending to more than fifty patients, a majority of whom were women. As someone who works primarily in rural Bihar and Madhya Pradesh, I usually encounter closed government health centres, absent doctors, uncooperative staff, or struggling patients. Why are these States so different in the indicators and delivery of health? This is the central question that Dipa Sinha’s book,Women, Health and Public Services in India tries to answer. Are the States different because of their economic performances? Sinha makes an excellent presentation of evidence from national and international studies as well as primary data analysis to effectively argue that differences in economic conditions do not adequately explain the inter-State inequalities in health outcomes. While economic well-being has positive impact on health at the individual level, such as lesser chances of an infant dying in a richer household, the same does not hold true when comparing two districts or States. For instance, even though Haryana was at the top among eighteen States for its economic performance on per capita National State Domestic Product in 2009-10, it ranked eleventh for its performance on infant mortality rates. On the other hand, Tamil Nadu, whose per capita National State Domestic Product in 2009-10 was less than sixty percent than that of Haryana, was the second-best performing State in terms of infant mortality rates. What, then, explains the variations in human development and health across States? The key, as Sinha puts it, is women’s status. Acknowledging that ‘status’ is difficult to conceptualize and measure, the book proceeds to analyse how certain aspects of women’s status such as education, work, autonomy and kinship systems, and women’s exposure to media influence health outcomes. The data analysis shows that education has the most significant positive relationship with a State’s performance in health. The States with higher female literacy (such as Kerala, Tamil Nadu, Himachal Pradesh, and Maharashtra) show a clear pattern of lower rates of infant mortality, under-five mortality, and stunting. In fact, female literacy emerges as a stronger factor in determining health outcomes than indicators of economic well-being. Further, women’s higher exposure to media and lower gender gap in access to media are also shown to have a positive correlation with health outcomes. However, women’s workforce participation and infant mortality rate is found to have a weak relationship, and no clear pattern is found between the indicators of women’s autonomy and health outcomes. Sinha rightly puts a caveat here by stating that ‘some aspects of women’s status may have an important “social” effect even though this might not show up in individual-level analysis’ (p. 49). This is especially true for the complicated relationship between women’s workforce participation and child-health outcomes. Many studies reviewed in the book showed that women’s employment negatively affected child health, and that there was an increased risk of child mortality and morbidity among children of working mothers. To this end, Sinha adds, ‘while children of women who are working outside the house might be at a disadvantage due to the absence of alternate childcare arrangements, an area or region where more women work places greater value on women, allows for collective action by women, makes women’s voices public and so on. All of these contribute to better human development outcomes’ (p. 49). Along with women’s status, the book emphasizes that public provisioning of health is an important determinant of health outcomes in a State. The chapter titled ‘Public Provisioning Matters’ is a timely reminder of why the continued push for privatization of health care in India, most recently by Ayushman Bharat, is a recipe for disaster. Unlike other commodities, markets do not always produce health care efficiently. They often miss important externalities that lead to overall improvements in health; asymmetric information prevents adequate information transaction between the buyer (patient) and the seller; problems of moral hazard may cause a buyer taking more health risks since the costs of such risks will be borne by others; and finally, markets may exploit the fact that people’s health seeking behaviours are shaped by their beliefs, leading to issues such as over-diagnosis or over-medication. These market failures, Sinha concludes, ‘along with equity and social justice considerations, make a strong case for state intervention’ (p. 54). This chapter makes another important point which is often not adequately highlighted even by the proponents of public expenditure on health. It is not enough to just have sufficient levels of public spending in health care. What matters equally is the quality and efficiency of that spending, and how it is distributed across sectors and populations. Sinha is on point in stating that quality and distribution of public spending in health go well beyond the issues of policy, and reflect the political will as well as the presence of public action in a State. To contextualize the role of women’s status and public provisioning in improving health outcomes in a State, the book then presents contrasting cases of Tamil Nadu and Uttar Pradesh. What really shines through is the richness of insights from field survey done in economically comparable regions of Tamil Nadu and Uttar Pradesh. Sinha talks about how different it was to conduct fieldwork among women in these two States. In Uttar Pradesh, she often had to identify her respondents using the husband’s name and the caste name; it was almost impossible to talk to the woman alone, and she was frequently advised by men not to talk to women since men thought women knew nothing. By contrast, but without suggesting that there was no gender bias in Tamil Nadu, Sinha discusses how most villagers in Tamil Nadu knew the names of the women respondents; it was easier to talk to respondents alone; and she did not encounter men telling her not to talk to women. These differences also indicate the overall pattern of variation in the status of women in these two States. In many public sphere, such as access to education, work, mobility, participation in associations, exposure to media, and relationship with natal family, women in Tamil Nadu were found to be significantly better off than women in Uttar Pradesh. However, in many private spheres, such as having cash in hand or domestic violence, while women in Uttar Pradesh were invisible, women in Tamil Nadu also had a poor status. Even as inequalities in the private sphere should be a matter of concern, Sinha makes a critical point here about the importance of focusing on women’s status in public sphere for human development goals: ‘When women directly deal with public institutions more (such as ration shops, hospitals, schools and public transport) and participate to a larger extent in public life, this is turn can be seen as having an influence over what become priority issues in society…Therefore, women’s status in public sphere can play a very important role and this hitherto has not been given much attention’ (p. 126). The two States also are found to be strikingly different in public provisioning of services. Despite its many shortcomings, especially in terms of large-scale scams and corruption, Tamil Nadu’s universal approach, democratized administration, convergence of services, administrative strength, and sustained public expenditure are mentioned as the features that enable Tamil Nadu to outperform Uttar Pradesh in effectively delivering public services. Sinha locates the reasons for Tamil Nadu’s relatively better performance than Uttar Pradesh in three categories: nature of State governments and political leadership; social movements; and the role of women in politics and public life. Tamil Nadu has had a more stable State government than Uttar Pradesh, and its cohesive sub-national identity has contributed to progressive social policies. The social mobilization of backward castes and classes, and their political affiliations in Tamil Nadu ensured universalization of public services especially in education and health. On the other hand, the recent rise of the Bahujan Samaj Party and the Samajwadi Party in Uttar Pradesh did not result in prioritizing enhancement of public services. Finally, there has been a greater presence of women as voters and participants in the politics and governance in Tamil Nadu. Whereas in Uttar Pradesh, Sinha observes that ‘the history of the State has been one where women have only become more marginalized’ (p. 179). This book does what it sets out to do: exploring reasons why States are so different in their performances in health and human development outcomes. It does so in a manner of writing that is jargon-free and thus, may be accessible to a wide range of readers, which is a mark of democratic writing. The rigorous analysis of quantitative data is well complimented with field survey and rich observations from the ground, leaving many hints for questions that could be further explored through quantitative as well as qualitative research. Finally, Sinha’s continued work with campaigns and movements for enhancing welfare services in India not only reflects in this scholarship, but is also a testament that it is possible to effectively combine research and action without necessarily compromising on the integrity of either. Kanika Sharma does research on the intersection of social inequality, gender and health in India. She also volunteers with social movements and campaigns. 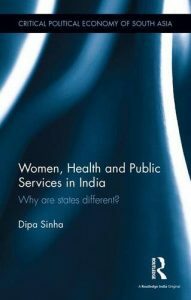 Reviewer name: WOMEN, HEALTH AND PUBLIC SERVICES IN INDIA: WHY ARE STATES DIFFERENT?